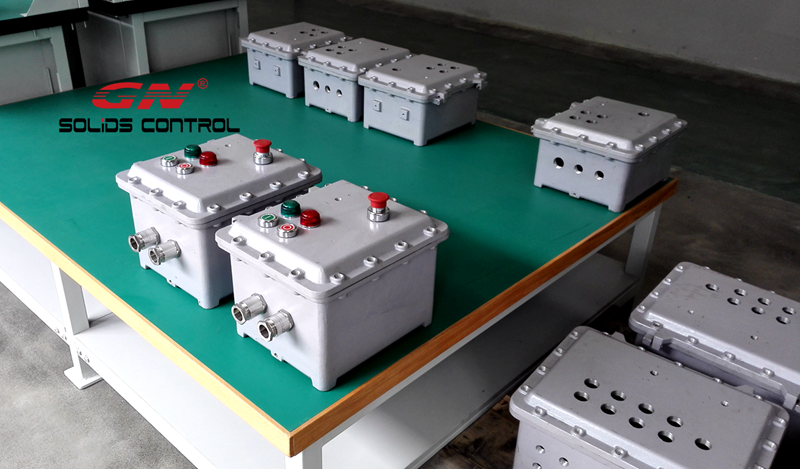 GN Solids Control makes high quality Explosion proof enclosure and different function electrical control systems for different industry applications. The EX enclosed and control system are made in high quality and full function but offered with very good price. Why GN Solids Control can make high quality Explosion proof enclosure and sell with very good price? 1) GN main products are drilling waste equipment and drilling waste decanter centrifuges. GN owns different function latest design CNC machines. GN uses the precision centrifuge processing machine to manufacture EX enclosure. So GN Solids Control can make Explosion proof enclosure with high quality in short time. And for the normal type of explosion proof enclosure, GN has stock in his warehouse for fast delivery. 2) GN owns its own technical engineering team to developing and manufacture electrical control system for all its own made equipment and systems. The centrifuge VFD control panel with PLC and HMI for smart control, it is developed and made by GN team. And the same team to offer technical support to the enclosure to meet for different applications. 3) All components of GN made electrical control system are from world famous brand, like Siemens and Schneider, and ABB. Many clients may wonder, why GN made Explosion proof enclosure do not have rubber for sealing, while other suppliers, their Explosion proof enclosure with rubber sealing. Its reason is that, the material of the Explosion proof enclosure is different. 1) The rubber sealing type Explosion proof enclosure is made from carbon steel. Because its sealing performance is not good. There should be separate rubber for sealing. 2) The aluminum alloy casting Explosion proof enclosure is with a excellent performance on sealing. As the rubber is very easy to get aged or worn out, so the aluminum alloy casting Explosion proof enclosure does not need extra sealing rubber.